When you take a closer look under the hood of the Honda Civic vs. Toyota Corolla, it’s clear that the Honda Civic is the more powerful of the two. The Civic’s base engine is a 2.0L 4-cylinder with 158 hp and 138 lb-ft of torque, which is surprisingly athletic for a compact sedan. The Corolla’s 1.8L 4-cylinder delivers only 132 hp and 128 lb-ft of torque, which is more typical of your standard sedan. The Civic also proved its performance chops during Motor Trend testing. The Civic’s standard engine zoomed from 0 to 60 mph in just 8.6 seconds, while the Corolla took 9.5 seconds to do the same. If you upgrade to the 1.5L turbocharged engine, the Civic’s time drops to just 6.8 seconds! If performance matters to you, you’ll be impressed by the 2018 Honda Civic. Since the Honda Civic is more powerful, you’d probably expect the Toyota Corolla to have the better fuel economy figures. 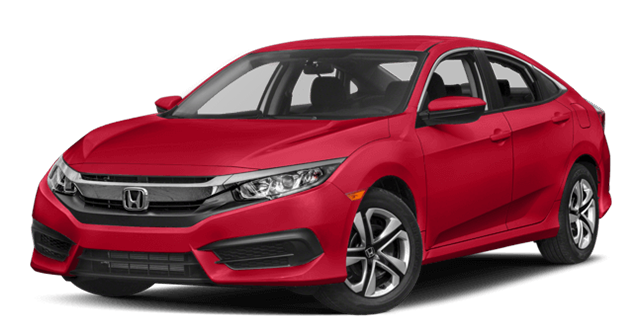 But, the 2018 Honda Civic surpasses expectations again with its efficient engineering. In fact, the base Civic with manual transmission gets 5 extra mpg on the highway when compared to its equivalent Corolla model. When inspecting the entire lineup, the Civic can generate up to 42 mpg on the highway*. The Corolla tops out at 40 mpg. You could save a lot of money at the gas pump by opting for the Honda Civic over the Toyota Corolla. Not only is it stronger and more fuel efficient, but the Honda Civic also has superior stopping power when compared to the Toyota Corolla. The Civic has larger rotors than the Corolla, as well as four-wheel disc brakes that maintain their performance even in inclement weather conditions. When you add all of these features up, the result is a better set of brakes on the Honda Civic. During Car and Driver testing, the Civic came to a dead stop from 70 mph in just 160 feet. It took the Toyota Corolla a shocking 187 feet to do the same. In a showdown between the Honda Civic vs. Toyota Corolla, the Honda Civic is simply the better bet. There’s just no comparison. But, you can see for yourself with a test drive at Jeffrey Honda! Stop by our dealership to get behind the wheel, or contact us with any questions. You can also apply for financing in advance. *32 city/42 highway/36 combined mpg rating for EX-T, EX-L and Touring CVT models. Based on 2018 EPA mileage ratings. Use for comparison purposes only. Your mileage will vary depending on how you drive and maintain your vehicle, driving conditions and other factors.